Our solid wood barstools are packed with value. Stylish, comfortable and durable - they are a blend of beauty and functionality. This beautiful Amish Abilene Bar Stool is handcrafted of your choice of solid hardwoods - choose from oak wood, maple wood or cherry wood. The wood is finished for durable protection and a gorgeous charm. 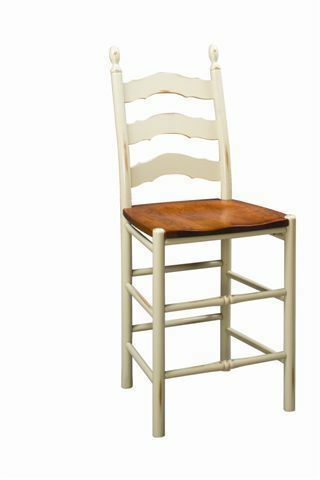 Molded wooden seats are standard with this French Country Barstool, giving them the contours needed for maximum comfort. If you prefer fabric, handwoven fiber or leather seat options are also available. Handwoven fiber seats are typically used in with French Country chairs and bar stools, though any option is a terrific one. Simply use our convenient drop-down menus to select the option that is right for you. This barstool comes standard with long finials, which a distinguishing characteristic of French Country style chairs and bar stools. This barstool has a solid four-leg design and does not swivel. We do off our French Country Swivel Bar Stool if you prefer a swivel style stool.